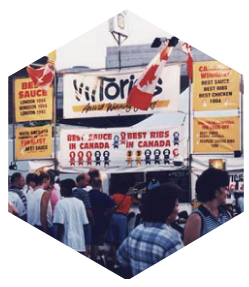 Vittorios Honey Garlic Sauce was originally created in Chef Vito's hometown of Stratford, Ontario in 1988 for the first annual Great Canadian Rib Cook-Off in London, Ontario. He sourced local honey from an apiary just west of Amulree and Vito had a very reliable local garlic grower in his dad, Rocco, who grew all the garlic in the back yard of his Queen Street home. The product was then prepared in the kitchen of Vittorios, Vito's Stratford restaurant. We have now developed a new Honey Hot Wing Sauce which will do to wings what our Honey Garlic Sauce does to ribs. 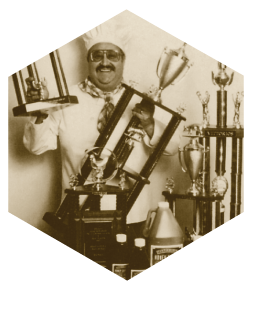 Vittorios Sauce has been given top honours in national and international competitions. Vito has travelled from Ottawa to Windsor and London in Canada and from Ohio to Kalamazoo and Detroit in the USA. Again and again, this sauce has earned Vito and his team 'International Best Sauce', 'People's Choice', 'Judges Choice', and overall 'Best Ribs' and 'Best Chicken' awards.This internationally-recognized, premium sauce is the perfect accompaniment for a vast array of dishes - from traditional ribs and chicken, to delicious peanut satays and baked beans. Distributed through fine restaurants and boutiques worldwide, including countries such as England, Japan and Dubai, the demand for these sauces is intensifying, so please check out our “where to buy” section to find a location nearest you and get your secret to award winning dishes! For delicious cooking ideas, check out our recipes below. Thanks for visiting, above all, enjoy! This premium sauce is made from real honey and fresh garlic. It works excellent with dipping chicken fingers or wings. 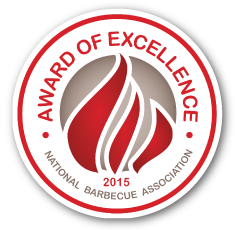 Soon to be your secret to award winning dishes. This is the quintessential honey-esque sauce with a blast of heat and sweet. A true accompaniment table sauce to any meat, perfect for dipping, grilling or in a crockpot. Made with quality ingredients! 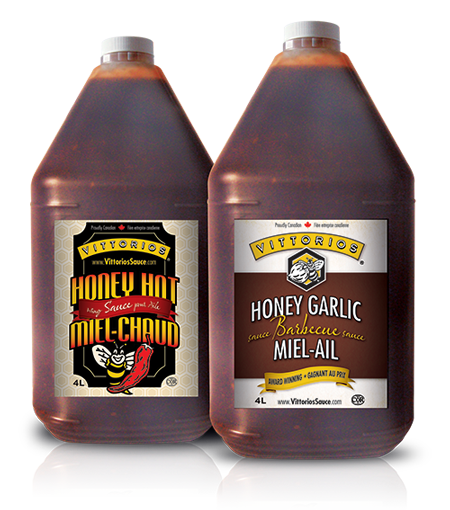 Those interested in distributing our products via retail or wholesale channels are invited to contact us at sales@vittoriossauce.com or 519.273.3707. Vittorios Sauce makes an excellent addition to Gourmet Gift Baskets! CHECK OUT SOME OF OUR RECIPES USING VITTORIOS® PREMIUM GOURMET SAUCES! Place ribs on wire rack in a deep pan with approx 2-3 inches of water. Cover with foil or lid, and place in oven at 375F. Cook until you can pinch through ribs (about 1 ½ hours). Remove ribs from pan and brush lightly with Vittorios Honey Garlic Sauce. If time allows, let ribs sit for an hour before proceeding. Heat grill or broiler. Brush on a bit more sauce and cook just to caramelize the honey on both sides of ribs. Brush one last time with sauce and serve. 1 lb. Chicken wings, tips-off split. Marinate chicken wings in ½ cup of buttermilk for 4 hrs. (overnight preferred). Take wings out of buttermilk, dust in flour and season with salt and pepper. Deep fry until golden brown and cooked. (8-10mins.) Tumble in Vittorios Honey Hot Wing Sauce and enjoy! Place the chicken parts in boiling water for approximately 45 minutes. With your grill hot, place the chicken on the grill and let water evaporate. Brush lightly with Vittorios Honey Garlic Sauce on both sides 4-5 times until chicken is fully cooked and nicely glazed. Saute onions, celery and mushrooms until soft. Add stock. Simmer for 5 minutes. In a bowl, toss cubed bread with seasoning and Vittorios Honey Garlic Sauce. Add sautéed vegetable and toss well. Let cool. Use in rolled ribs, or as stuffing for chicken, pork loin or turkey. Mix well. Let stand 2 hours. Good for marinating steaks, chops, poultry and seafood. This marinade also makes a very good light basting sauce for salmon, trout, sole, etc. Mix well and apply to ham half way through the cooking process. Baste frequently. Soak beans overnight in water. In the morning, drain beans, add fresh water and baking soda. Simmer until tender. Drain, reserving water for later use. In a baking pan, mix all remaining ingredients and 4 c. of reserved water. Bake covered at 250oF for 3-4 hours, adding more water if necessary. Cooks to 14 cups by volume. Mix and refrigerate 2-4 hours. Serve and enjoy! Purchase split whole chicken ( ½ chicken per person). Marinate in buttermilk (min 4 hours up to 1 day). Season with salt & pepper. Start bbq and place foil wrapped brick onto heat. When coals are hot oil grill and place chicken skin side down. Place brick on top and close lid. let cook for 5-7 min. Check for flare-ups. Turn chicken over, brush with Vittorios Honey Hot sauce and let cook 5-7 min. Put brick on top. After 7 min. remove brick. Turn over and sauce, cook to caramelize 2 min. Do this 3 or 4 times. Serve with slaw or garden fresh tomatoes. Brush salmon portions with Vittorios Honey Hot sauce (1 portion per serving) and place in plastic bag (2 - 4 hrs.). Soak cedar plank for same time. Lite fire when hot. Place plank with salmon portions on and close lid. Half way through the cooking process squeeze fresh lemon on top. This should be done in no more than 15 min. depending on heat in bbq. You could use a side of salmon if serving a large group. Serve with roast corn in husks and side salad. Add zip to your favourite meatloaf, hamburger or sausage recipe by adding Vittorios Premium Gourmet Sauces when mixing the ingredients together. Also, add zest to any stir fry, just stir in 1 tbsp of Vittorios Honey Garlic Sauce just before serving. Vittorios® Award-Winning Sauces are Sold at the Following Fine Retail Locations. Locations are Listed Alphabetically, by City. Mill & Francis St. E.
VITTORIOS® Premium Sauces are Winners in Canada & U.S.A.
Do You Have Questions, Comments or Suggestions About our Products? Copyright © 2016 Vittorios Award-Winning Sauces. All rights reserved.